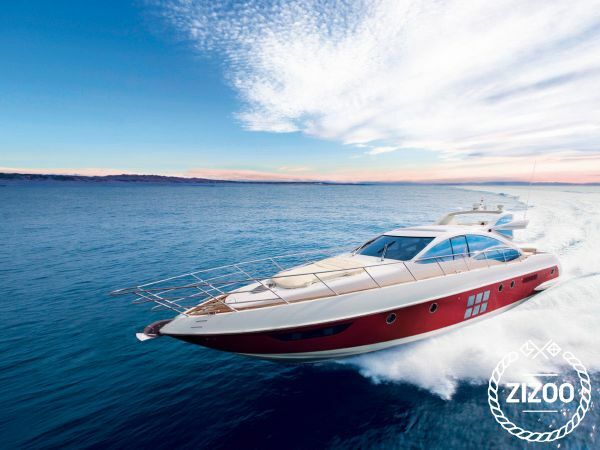 Sportiness and technology are the two key design concepts in the sleek and stunning Azimut 68S luxury yachts. These are models which facilitate and amplify the enjoyment of plain air living, where the operable hard top The 68S configuration is what’s known in Europe as an open — think express cruiser on a grand scale. The main deck is one level and includes the saloon, helm and cockpit. One of the many surprises is a set of three glass sliding doors that move completely out of the way to create continuous open living space from the windshield to the transom. Open means just that too, as the retractable cabin roof brings in the sunshine and breezes. The sun a bit too warm? Close the roof and deploy the retractable fiberglass canopy over the cockpit seating area. Open the power-operated side windows in the saloon for cross ventilation. The choice is yours. Sunbathing To catch the rays, there are sunpads at the stern and on the bow both expansive with articulating headrests.